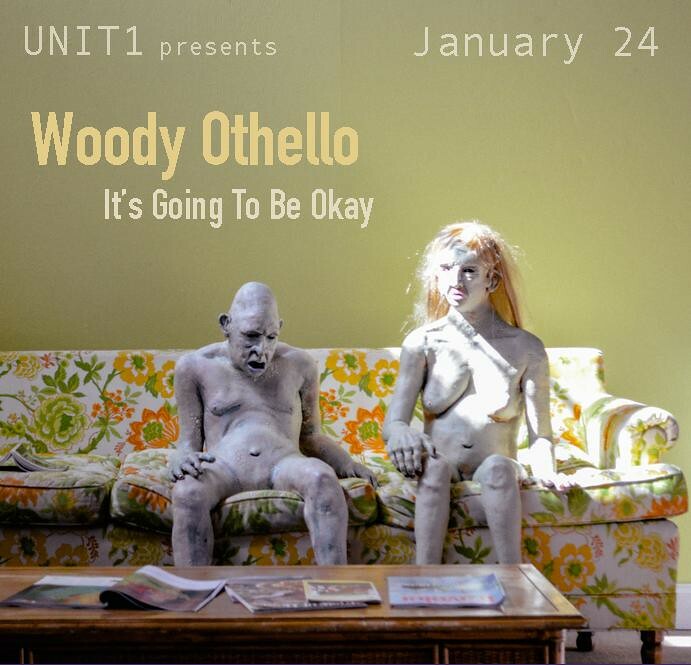 Lake Worth exhibition space UNIT 1 is pleased to announce: “It’s Going To Be Okay”, the premiere solo exhibition of rising talent Woody Othello. Othello, a Lake Worth based artist and FAU graduate creates installations of paintings, sculptures and every day objects that are both disturbing and banal. “It’s Going To Be Okay” is a site-specific installation at UNIT1 exhibitions that Othello will create to reflect, on psychic entropy and its effects on the physical self. Using technology as a metaphor for psychic interferences, the work extends Othello’s ongoing efforts to examine negative external stimuli and their harm to the individual. Othello has recently risen to popular attention in a string of strong showings at several group exhibitions over the past year-most notably in the Monstrous Strange exhibition at Fat Village Projects and Southern Exposure at the Palm Beach Cultural Council. As an Artist in Residence at the Armory Center for the Arts on West Palm Beach, Othello has spent the past several months preparing for the show by creating ever more strange and curious characters to inhabit his artistic odditorium. Lovingly crafted in ceramics and then clothed and positioned in appropriately banal interior spaces complete with wall decorations and flickering televisions, Othello’s misfit children bring to mind the psychoplasmic offspring of David Cronenberg’s 1979 film “The Brood”. Although the grotesque humanoids Othello gives birth to often appear to be festering and diseased, they somehow inspire a strange affection in the viewer. Perhaps it is by isolating and then giving form to his own psychic afflictions that Othello has provided an avenue for us all to instigate a similarly cathartic release. Folk custom has long been inhabited by similarly revolting gargoyles or medusa heads that in actuality serve as good luck objects to ward off evil. Othello himself, in my subjective analysis, is curiously lacking the visible neurosis one associates with young artists, and so it might be true that by isolating and then exorcising the demons that afflict us all, he has in fact invented a type of idiosyncratic therapy that does actually get results. Regardless, this much anticipated show is sure to be a hit with the local art community and hopefully will calm the psychic storm that has been generating all these bad vibes the last few months. The show will also feature musical performances by WASHA and Boy Orbison. WASHA, the moniker of Fort Lauderdale musician Dwight Pendleton, recently released a four song EP, “The Bright, Part 1”. Produced by local mastermind David Barnard (Celebrator, Sweet Bronco) the album shimmers with dreamy and ethereal song-scapes that sound like they were recorded in a cathedral. Layering Pendleton’s choirboy voice above spare guitar riffs drenched in reverb and then infusing additional atmospherics recalling Tim Hecker and Aix Em Klemm, Pendleton and Barnard have created a sublimely beautiful collection of songs. Boy Orbison, a David Lynch inspired side project from the band in Heaven mastermind Ates Isildak will be performing their first live set. Although they’ve released very little material as of yet, expect dreamy and psychedelic nostalgia from this noire-lounge duo. The show is being curated by Don Fils, Unit 1 Assistant Curator.